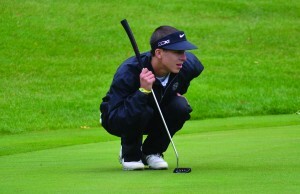 First-year Riley Till eyes a putt during the UD Fall Invite over the weekend. The men’s and women’s golf teams both finished fourth overall. DUBUQUE — The men’s and women’s golf teams have both turned in strong performances so far this season. Earlier in the month, the women won the Benedictine Universities Invite with a team score of 56-over par. The victory was monumental for the team because it was their first victory in the tournament in six years. The girls followed up with last week’s victory with a fourth place finish at the Luther Invitational. The Duhawks were led by junior Mara Simonson who turned in a 91 and an 85, and finished 16th. Senior Lauren Gonner was not far behind, shooting an 89 on both days and finishing in 20th. 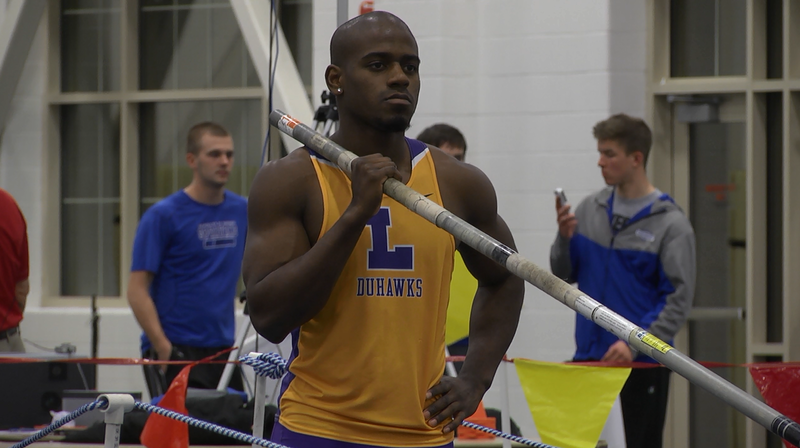 The men’s team continued their season last Saturday and Sunday at the University of Dubuque Fall Invite. They finished fourth with a team score of 64-over and 624 overall. Junior Jason Beer and first-year Pete Leinenweber led the Duhawks by tying for 11th with a 16 over par. The men will finish their season next Tuesday at the Midwest Region Fall Classic in the Wisconsin Dells, while the women will compete in the IIAC Championships this Saturday in Cedar Falls.